It seems I have always had dogs in my life. We got our first dog when I was about 3 and I have been in love with them ever since. I’d like to tell you about the dogs in my family for National Dog Day. Bubbles was an accident. A friend’s Poodle mated with the neighbor’s Cocker Spaniel and we got one of the puppies from the litter. She looked more Cocker Spaniel than Poodle. She was black and white, smooth coated, with curly hair in places. She was a great dog for children. She loved being in the middle of all our games. Somehow she survived all five of us. It’s amazing she did so well with kids since she suffered from seizures. I can still remember them. My mom used to kick us out of the house when she had one. But, eventually, I was alone with her after school one day. I remember petting her and soothing her until it was over. There was no medication back then to ease her suffering. She was a trooper. She tolerated the Santa costume, the bathing suits, and yes, that odd get up that she is wearing in the photo at the top of the page which I absolutely refuse to take responsibility for. She was the best first dog a family could have. 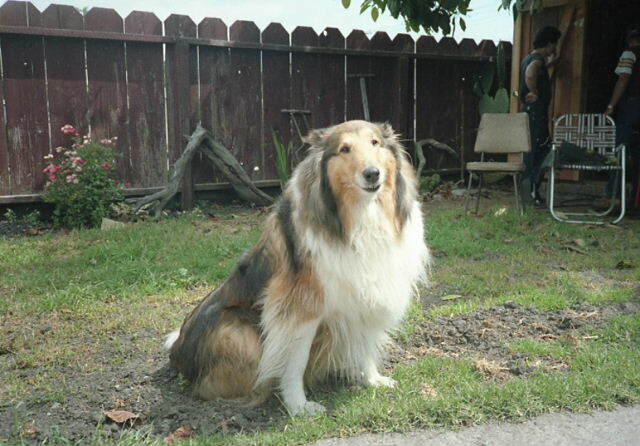 Shoshaunee was a purebred Collie. She had the pedigree papers and fancy name, Paragon’s Emerald Princess, to prove it. I was in my teens when we got her. 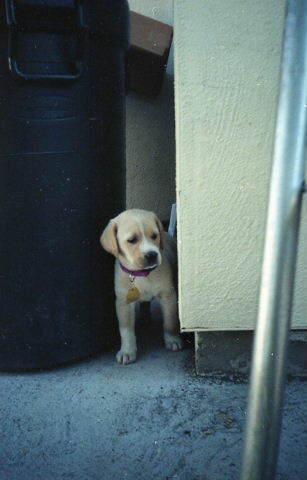 Even though she was the family dog, Shaunee, as we called her, had eyes for only one person, my brother, Troy. She was one of those dogs who peed whenever she was nervous. She was uncomfortable around children, but fine with us teenagers. I was always amazed at how she understood boundaries. 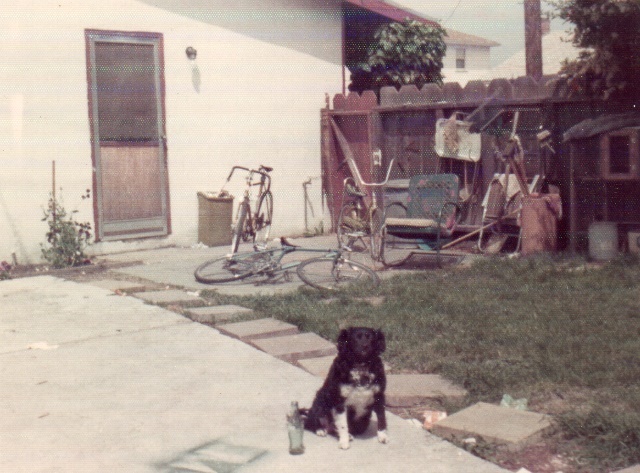 Back in the 70s, people had their dogs out front unleashed all the time. I wouldn’t do that today. Shaunee knew that her territory was from our garage to the neighbor’s garage. She followed my brother to the garage every night and roamed while he worked on cars. She never strayed. Once I looked out the front window and there she was sitting on the front lawn all by herself. She followed someone out, but couldn’t get back in, so she waited. She also had a funny little habit. She was not allowed on the furniture. So, she would very deliberately back up and sat with one back leg on the cushion. Everybody got a kick out of that. What can I say about Sierra that I haven’t already written? She was a handful for the first 3 years. Wild, aggressive, domineering. She was afraid of nothing. I worked with her constantly, then she mellowed and became the awesomeness that Labs are known for. Her worst quality was that she was a thief. She’d rob you blind right under your nose. She could gauge if you were paying attention and seize the moment. It wasn’t always food, but it was her favorite loot. She once took a bite out of a pie while we were all facing the darn thing singing “Happy Birthday to You”. She took toast out of the toaster. She stole a whole loaf of homemade bread right off our counter. I had to chase her and pry it out of her mouth. She was an amazingly, loving dog, gentle with the kids–everyone loved her. She thought the people at the Vets were waiting for her to come in so she could grace them with her presence. Her wagging tail expressed her joy and was a force to be reckoned with. Beware table tops and Christmas trees! She had her leg amputated when she was 10 because of cancer. Even when she developed arthritis she got up each day eager to eat breakfast, take her walk, lay in the sun spot, and wait for her favorite people to stop by. She loved her tummy rubs. I was going through my own disability at the same time and she inspired me to greet each day with determination. Misha is the dog who graces this blog. 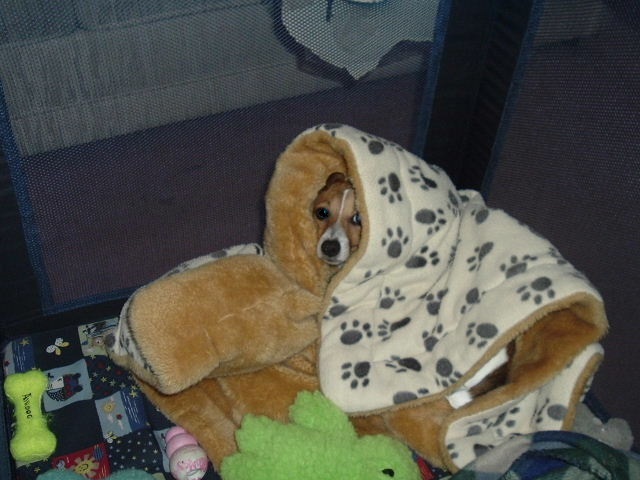 A Jack Russell Terrier who was a gift from my nieces. She was becoming a sweet, balanced dog, if a little timid, when her first birthday rolled around. Then, my dad died and we moved. She went through the doggie equivalent of a nervous breakdown. A problem exacerbated when she developed the anxiety issues associated with Proin. I won’t recount our numerous challenges as she regressed into an untrained state. There are many posts on this blog detailing them. She’s 8 years old now and a lot of it is behind her. She has gone from a dog who lost all trust in humans to one who recently let a stranger pet her. She has quirks, for sure. She’s afraid of a lot of things (the aluminum foil roll, flyswatters…). She does not like to be picked up and tells you so in no uncertain terms, but she loves to jump up on your lap and get a neck massage. She has to get a drink of water every time she goes outside even if she is needs to go out to pee. I wish she were more trusting, but we have to work with who our dogs are right now. We do the best that we can to work out the kinks and adapt to their limitations when we have to. She’s my little goofball and my blanket spy. She’s special in her own crazy way. And, though she is reluctant, once she decides you’re okay, look out, because she will adore you with every ounce of her 8 lbs. Leigh Brill recounts what it was like being diagnosed with cerebral palsy and watching her abilities crumble away. Then, Slugger, a companion dog, came into her life and changed it for the better. Their special bond shines through this dog based memoir. As someone who is disabled, this book touched me in a personal way. All four of them wonderful. All four unique. All four special in their own way. It’s National Dog Day. Please tell us about your dog in the comments! And please check out these awesome National Dog Day posts! Your family dogs are pawsome, every one! I cherish the uniqueness of each dog I have had the privilege to leave their paw prints on my heart. We are celebrating Dog Day too, along with the fact that it is the 3rd anniversary of my dog blog! You’re invited to add your family dogs article to our Dog Days link-up on Dog Pawsitive Tidbits…smiles. Ruth, It’s so true. It’s their uniqueness that makes us love them all the more. Congratulations on your third anniversary! I’ve joined your linkup and look forward to reading the posts.